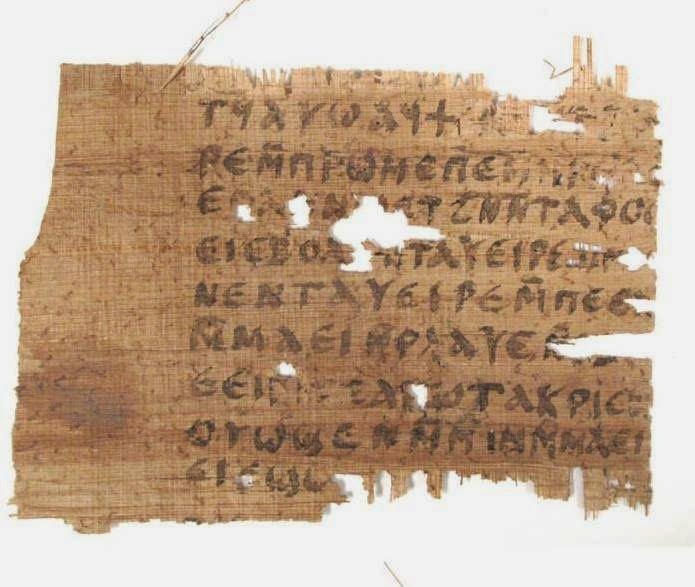 There are several items of interest on the Jesus' Wife Fragment that have emerged over the last few days or so and I hope readers won't mind if I draw attention to these in a "round-up" post. If I have missed anything important, please comment and I'll add those too. 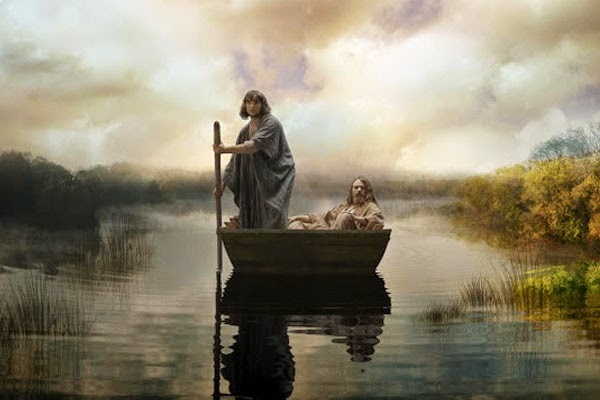 Allen's post helpfully follows up on her earlier Weekly Standard piece, The Wife of Jesus Tale, which bucked the rather triumphalistic tone of the broader media coverage that somewhat prematurely announced the fragment's authenticity earlier in the month. Her latest piece incorporates the key insights found in Christian Askeland's post and Alin Suciu's post, also discussed here (with illustration) in which the "sister" to the Jesus' Wife Fragment, a piece of Coptic John, shows very clear signs of modern forgery. My favourite line in Allen's post is "This is getting into monkeys-with-typewriters territory." She concludes with a call to Harvard Divinity School and the Harvard Theological Review to reveal everything that they have about the fragment. Given the increased difficulties about the provenance of the fragment, it indeed seems essential now to release these materials, especially the undated, unsigned hand-written note in which Prof. Fecht is alleged to have associated the fragment with Jesus' marriage. The "Gospel of Jesus' Wife" as a Questioned Document: What Would Simulated Ancient Writing look like? I quote here a part of his piece, which provides a salutary lesson: Finally, a lesson might be drawn from the debate over the supposed drawings of Galileo Galilei in two copies of his Sidereus Nuncius, one of them allegedly the proof-copy; the story is set out in an article by Nicholas Schindle [sic] in a recent New Yorker (“A Very Rare Book,” issue of December 16, 2013). One of the copies, alleged to contain Galileo’s own drawings, appeared in 2005, and was offered to a New York bookseller. A team of researchers at the Humboldt University in Berlin tested the book extensively, and declared that it was genuine. They published their findings in a two-volume work, Galileo's O, edited by Horst Bredekamp (Berlin, 2011). Independently, Nick Wilding, assistant professor at Georgia State, began to investigate the claims, and finally traced the book back to Massimo De Caro, previously Director of the Biblioteca Statale dei Gerolamini, Naples, who is now in prison and claims to have forged the book as a joke. 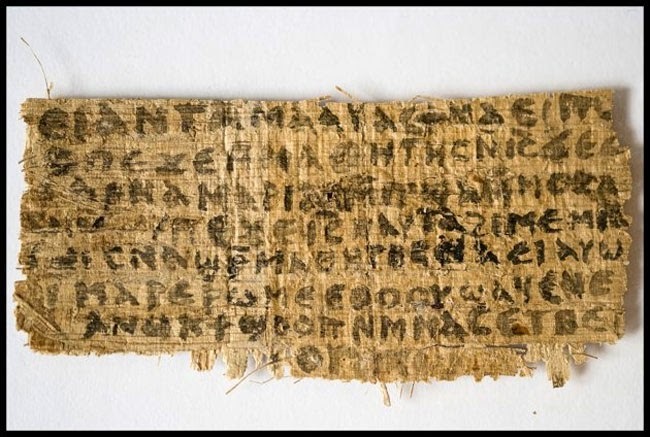 It therefore becomes imperative to trace the Gospel of Jesus’ Wife papyrus back to its source . . .
We now know that laboratory tests used to assess the age of papyrus fragments don’t always catch modern forgeries. In the April 2014 issue of Harvard Theological Review, the results of numerous laboratory tests run on a papyrus fragment were published (some in the periodical, some online). The tests were performed by top scientists from Harvard University, Columbia University, Massachusetts Institute of Technology (MIT), and the University of Arizona. Radiocarbon measurements of the papyrus fragment were carried out by accelerated mass spectrometry twice, first showing the fragment dated between 681 and 877 CE, then showing it dated between 648 and 800 CE (median 718 CE). This papyrus was a fragment of the Gospel of John: nothing in the laboratory tests suggested it was a modern forgery . . . but it is. 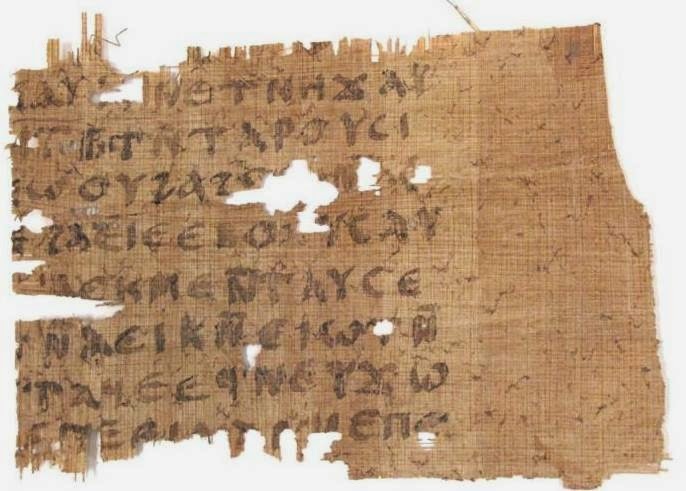 Since seeing images of the papyrus fragment on Harvard Divinity School’s website last Thursday, Christian Askeland has demonstrated that this Gospel of John fragment simply cannot be a genuine ancient manuscript. It shares all 17 of its line breaks with another manuscript of John (Codex Qau). Given that scribes had different size handwriting, page widths varied, etc., authentically ancient manuscripts just don’t have this kind of similarity with each other. And they certainly NEVER have the same kind of relationship Askeland has noted here. The recently examined Gospel of John fragment copies every other line break from Codex Qau . . . with one exception. The last two line breaks copied from Codex Qau are consecutive – it’s a page break in an edition of the codex published in 1924 that separates them instead. While science has given us many exciting and powerful tools that can be used in laboratory analysis, these tools unfortunately can’t always answer the questions we would like. In the future study of manuscripts, we would all be better served if we gave other types of analysis (textual, paleographic, etc.) the consideration they genuinely deserve. If one modern forgery could escape detection in laboratory tests, is there any reason to suspect that another couldn’t as well? I blogged last night on Jesus' Wife and her Ugly Sister, picking up on Christian Askeland's devastating post, Jesus had an ugly sister-in-law, in which he drew attention to the the Coptic Gospel of John fragment that emerged from the same collector at the same time as the Jesus' Wife Fragment. Askeland noted that this fragment, which is in the same hand as the Jesus' Wife Fragment, is clearly a forgery. Alin Suciu, Christian Askeland finds the "Smoking Gun", helpfully illustrated how the verso of the John fragment was clearly copied from Herbert Thompson, The Gospel of St. John According to the Earliest Coptic Manuscript (London: British School of Archaeology in Egypt, University College, 1924), line breaks and all. Thompson's edition is based on the Cambridge Qau Codex and like Grondin's Interlinear Gospel of Thomas that appeared to have been used for the Jesus' Wife Fragment, it is available online. It is not clear from the ETANA website when the PDF was uploaded, but the properties of the PDF itself show that it was created in 2005 and modified in 2008, well within the time frame for the presentation of these fragments to Prof. Karen King. The graphic above should speak for itself but essentially the point is this: the forger appears to have copied mechanically every other line from the Thompson edition. Every line break is the same. It is beyond reasonable doubt that this is a fake, and this conclusion means that the Jesus' Wife Fragment is a fake too. The joke title relates to the fact that since the Jesus' Wife Fragment was released in September 2012, there has been talk of a sister fragment, a Coptic fragment of the Gospel of John. This fragment, along with the Jesus' Wife Fragment, was alleged to have been part of a cache of six fragments, and many of us wondered whether studying this related fragment might help with establishing the authenticity of the Jesus' Wife Fragment. The difficulty, however, was that pictures of this fragment had not been released. It turns out, however, that the Harvard Divinity School's Website on the Gospel of Jesus' Wife in fact features several much fuller versions of the material tests published in the recent Harvard Theological Review, including a couple of pictures of the hitherto unpublished John fragment, one in the Ink Study page, specifically James Yardley's report (PDF), and one in the Infrared Microspectroscopy page, specifically Timothy Swager's report (PDF). Those of us who have spent a lot of time staring at the Jesus' Wife Fragment will have found it an eery experience to have laid eyes, finally, on this related fragment today. It is remarkable just how similar the hand is here, as Christian Askeland points out. 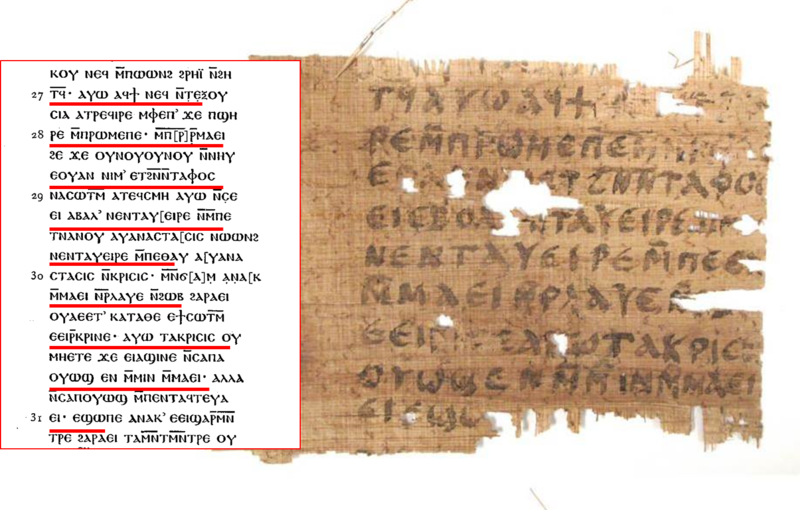 Moreover, the text of the manuscript appears to replicate the text of Herbert Thompson, The Gospel of St. John According to the Earliest Coptic Manuscript (London: British School of Archaeology in Egypt, University College, 1924), line breaks and all. Christian Askeland finds the "Smoking Gun"
Suciu helpfully lays out the parallels between the verso of the fragment (above) and Thompson's edition. I've checked the recto and the same is true for that too. (I'll post an illustration tomorrow if anyone is interested). Leo Depuydt has also been in touch today to say that he has checked up on the parallels and it is clear to him too -- this fragment is copied from Thompson's edition. Like Grondin's Interlinear Gospel of Thomas on which the Jesus' Wife Fragment appears to depend, Thompson's 1924 edition is also available online. Essentially all specialists believe that Lycopolitan and the other minor dialects died out during or before the sixth century. Indeed, the forger tried to offer two manuscripts both in Lycopolitan, but made two crucial mistakes. First, the NHC gospel of Thomas is not a pure Lycopolitan text, but the Qau codex is. That is we have two clearly different subdialects of Lycopolitan, which agree exactly with published texts. Second, this GJohn fragment has been 14C dated to the seventh to ninth centuries, a period from which Lycopolitan is totally unknown. I should make clear that unlike Christian Askeland, Alin Suciu and Leo Depuydt, I have no expertise in these manuscripts and dialects. But not only do I trust their judgement but also I have carefully studied the Thompson edition and this fragment of John and there seems little doubt to me that the one is copied from the other. Kudos to Askeland, who was suspicious of the Jesus' Wife Fragment from the first, for taking the time to investigate this further and for sharing his expertise. I am hoping to comment on these developments, and others, in due course, but one quick thought at this point: a great deal of time could have been saved by releasing images of this John fragment back in 2012. It is material evidence in the case. Even now, the pictures have only been released inadvertently as part of a study of the ink, not in order for the manuscript and language experts to study them. I'd like to ask now, again, for a full release of all the other related materials -- the other four manuscripts in this cache as well as the associated back-story materials. Update (30 April): I have changed the original title of this post, which echoed a joke about Cinderella's "ugly sisters" in describing this "sister" fragment as "ugly". On reflection, I realized that the joke was in poor taste, and I would like to apologize to those who were offended by it. Regular readers may recall that the documentary was originally scheduled to go out on 30 September 2012, within a few weeks of the media campaign that began on 12 September 2012. However, Smithsonian decided to put the documentary on hold, and some began to wonder if it would ever see the light of day. It then surfaced in France under the title Révélations sur la femme de Jésus and now it is slated to appear in an English version soon in the USA. Our findings indicate that Laukamp was a co-owner of the now-defunct ACMB-American Corporation for Milling and Boreworks in Venice, Fla. Documents filed in Sarasota County, Fla., show that Laukamp was based in Germany at the time of his death in 2002 and that a man named René Ernest was named as the representative of his estate in Sarasota County. In an exchange of emails in German, Ernest said that Laukamp did not collect antiquities, did not own this papyrus and, in fact, was living in West Berlin in 1963, so he couldn't have crossed the Berlin Wall into Potsdam. Laukamp, he said, was a toolmaker and had no interest in old things. In fact, Ernest was astonished to hear that Laukamp's name had been linked to this papyrus . . . .
Update (10.18pm): Alin Suciu makes the good point that Laukamp would not have had trouble, if he had West German papers, in travelling to East Germany, so it may be that this aspect of the story requires revision. "West Berliners were treated differently from other West Germans by the East German authorities. In 1963/64, the only period when an ordinary West Berliner would have been able to cross to the East was over the Christmas period, from 17 December 1963 to 5 January 1964. (Detailed chronology in the Wikipedia article at http://en.wikipedia.org/wiki/West_Berlin#Traffic_between_East_and_West_Berlin). So while it is not impossible that Laukamp obtained the papyrus in Potsdam that year, it seems unlikely for someone with no prior interest in such material." This link discusses pass agreements between west-east Berlin. So it appears that indeed it is the case that a 1963 purchase of the fragment by Hans-Ulrich Laukamp in Potsdam is problematic. The interview is typical of the grace and clarity with which Prof. King approaches this subject as well as all her scholarship. Although I am inclined to disagree with her on the subject matter, I, for one, am delighted that the dialogue genuinely appears to have opened up. HT: Mike Grondin on the Gospel of Thomas e-list. It's now almost a week since Harvard Theological Review published its issue focusing on the Jesus' Wife Fragment (The Jesus' Wife Fragment is Back). I have enjoyed spending time reading and studying the issue over the last week and I am planning to offer some of my responses to it in due course. Francis Watson composed an initial response last week, Jesus' Wife Attempts a Comeback: Initial Response, and I would also draw attention to Christian Askeland's helpful comments, Jesus' Wife Resurrected from the Dead, alongside his fascinating post drawing attention to an element in Leo Depuydt's article, Demotic Gospel of Thomas. Leo Depuydt's article in HTR is entitled The Alleged Gospel of Jesus's Wife: Assessment and Evaluation of Authenticity, and it is followed by a response from Karen King. The Papyrus Fragment and the Crocodile: When Discerning a Blunder Is Itself a . . .
Update (Thursday, 8.50am): Jim Davila criticizes the sarcastic tone of Depuydt's response on Paleojudaica, concluding with the comment "I am still quite skeptical that the Gospel of Jesus' Wife is an ancient artifact, but King has made a real effort to keep the tone high and the skeptics should do the same." Jesus Christ is one of the most famous names in the history of mankind. But Gospel writers left out crucial details about pivotal events in Christ's life - historical moments that have been adapted, embellished and rewritten over the course of hundreds of years. This special re-examines elements of Christ's life and ministry, such as the nativity, the miracles and the crucifixion - questioning basic modern assumptions to reveal some surprising and often shocking details. This and other photographs suggest that there will be some idiosyncratic elements covered, including legends like Jesus in England. Earlier pieces by Prof. Watson on the fragment are gathered here.